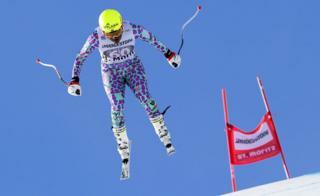 Image caption Kenya's Sabrina Simader flies through the air during her women's slalom race in St Moritz, Switzerland on Saturday. 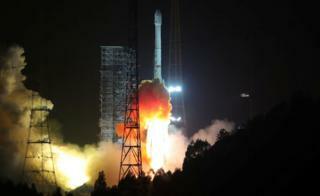 Image caption Also lifting off is Algeria's first telecommunications satellite at the Xichang Satellite Launch Centre in China on Monday. 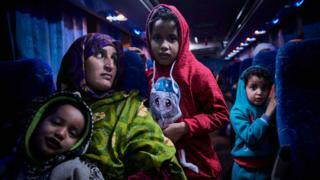 Image caption And this family from Mali are some of the hundreds of migrants who have been helped to leave Libya and go home in recent weeks following shock and outrage around the continent at the reports. Image caption While in this photo released on Friday, Isabel Antonio, a 16-year-old singer and refugee from the Democratic Republic of Congo, poses at the Ipanema beach in Rio de Janeiro, Brazil. She has won the hearts of millions of viewers of TV talent show The Voice Brasil. Image caption And in California, Kenyan-Mexican actor Lupita Nyong'o poses on the red carpet during Saturday's world premiere of Star Wars: The Last Jedi. Nyong'o plays the role of Maz Kanata. 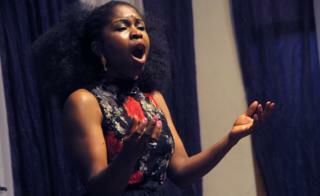 Image caption Back on the continent, Nigerian soprano Omo Bello rehearses in Lagos. 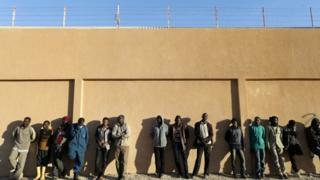 Opera is not particularly well known in Nigeria but AFP reports that a crowd gathered to hear her practise. 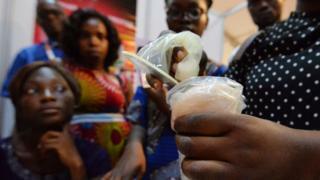 Image caption On Friday, a woman demonstrates how to use a female condom at the 19th International Conference on Aids and Sexually Transmitted Infections in Africa (Icasa) in Ivory Coast's main city, Abidjan. 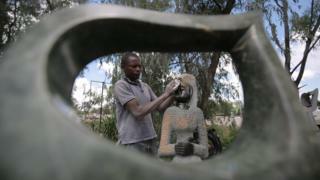 Image caption This stone sculptor is polishing his wares in Harare on Tuesday. 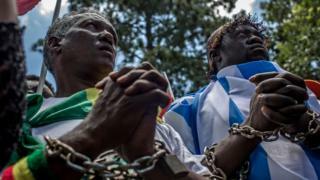 He is among the millions of Zimbabweans hoping that business will improve under new President Emmerson Mnangagwa, as tourists often buy these sculptures as souvenirs. 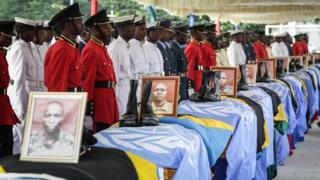 Image caption On Thursday, members of Tanzania's security forces pay their respects as the bodies of 14 UN peacekeepers were sent back to Dar es Salaam after they were killed by rebels in DR Congo last week. 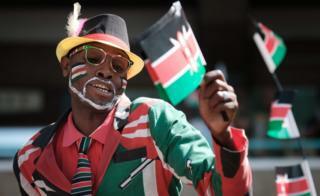 Image caption This man was among thousands who celebrated the anniversary of Kenya's independence from the UK on Tuesday, which was Jamhuri (Republic) Day. 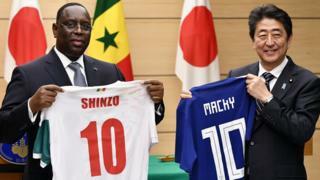 Image caption Senegal's President Macky Sall and Japan's Prime Minister Shinzo Abe exchange football shirts at the end of a joint press conference in Tokyo on Wednesday. 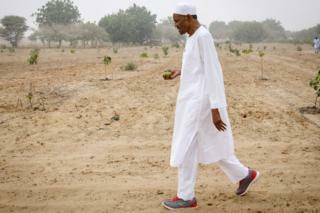 Image caption Meanwhile Nigeria's President Muhammadu Buhari visits his farm in his home town of Daura. 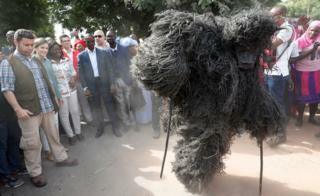 Image caption And the Spanish Queen Letizia (2nd left) watches a traditional masquerade in the southern Senegalese town of Ziguinchor. 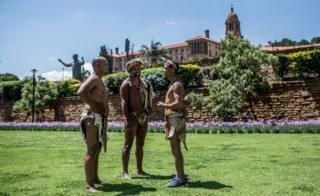 Image caption These Khoisan chiefs walked for two weeks from Port Elizabeth to Pretoria, where they camped out at the Union Buildings, the seat of government, to demand official recognition of their language, and their community as South Africa's original inhabitants.